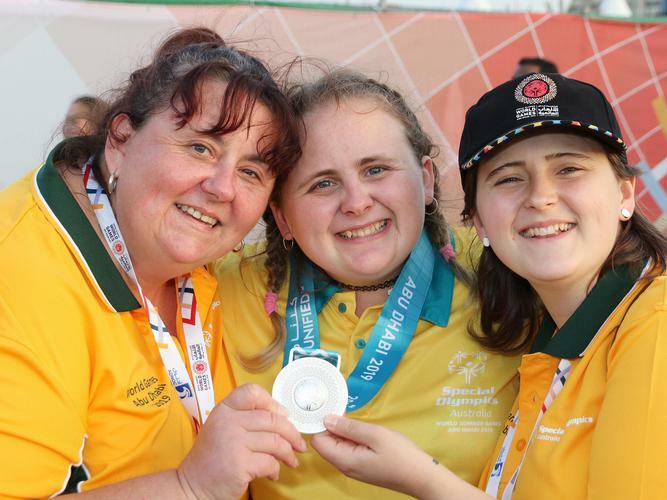 Two employees of Bedford Group have represented the country and the disability service provider by bringing home medals at this year’s Special Olympics World Summer Games in Abu Dhabi. The competition ran from March 14-21 with 109 athletes participating in 11 sports, including bocce, basketball, tennis, football, equestrian, athletics. bowling, golf, gymnastics, sailing and swimming. 21 year old Alicia Martino won a gold medal in the 100 metre backstroke, two silvers in the 100m freestyle and three bronze in the 200m backstroke. While, 21 year old bowler Rachel Fenwick took home her first gold in the female singles event, three bronze in the doubles and three bronze in the team events. Chief Executive Officer (CEO) of Bedford Group Maggie Dowling says the organisation is thrilled for both girls and hope they enjoyed the experience. “Everyone here at Bedford is so proud of Rachel and Alicia who’re taking on the world and winning gold for Australia in swimming and ten pin bowling. CEO of Special Olympics Australia Corene Strauss welcomed home Team Australia on Saturday. “It is a tremendous honour for our athletes and a culmination of many years of effort and achievement from them, their families and their coaches to represent Australia at the largest sports and humanitarian event in the world during 2019. “There have been so many individual and team achievements. Ms Strauss thanks Team Australia’s partners and supporters for helping the team on their journey to the games, including Sport Australia, Melbourne Cricket Club, SAS, IGA, Law Enforcement Torch Run, Goodman and Clubs NSW, Etihad Airways, National Australia Bank and other private supporters and local communities.